Longtime HEF supporters -- enjoy memories of Frances Landers and Pere Albert. Newcomers -- enjoy reading HEF's miraculous history. A great gift, too! Author Martha Abbey Miller will custom inscribe and ship her softbound book to you. If you want the book signed in honor of someone, what would you like it to say? Read Frances Landers's Compelling Biography! Thousands of peasant farmers and their families live in a remote mountainous region called Grande Colline, in southwest Haiti. They struggle daily with little income, meager crops, inaccessible water, insufficient health care, and inadequate homes. But twenty-seven years ago, these Haitians had even less. The parents' religion was the frightening darkness of voodoo. In virtually the entire regain, no one could read or write. Tens of thousands of children wandered aimlessly. In January 1989 a Haitian priest moved to the village of Cherident, in Grande Colline. His bishop sent him to this rugged outpost to pastor seven fledgling Episcopal churches. The priest, Pere (Father) Jean-Wilfrid Albert, tirelessly converted tens of thousands of peasants from voodoo to Christianity. His churches would expand to forty-five. And Pere Albert did much more, with the immense help of Frances Landers from Arkansas. In 1989 the priest challenged Frances to raise money in the United States, to build and operate Haitian schools. To end illiteracy across his Episcopal parish. To bring hope. Across twenty years, Frances built schools in forty villages, funded hundreds of teachers and principals, and changed tens of thousands of Haitian lives. American lives, too, as countless supporters have helped Frances's Haiti Education Foundation thrive, even after a monstrous earthquake. Even six years past Frances's death. 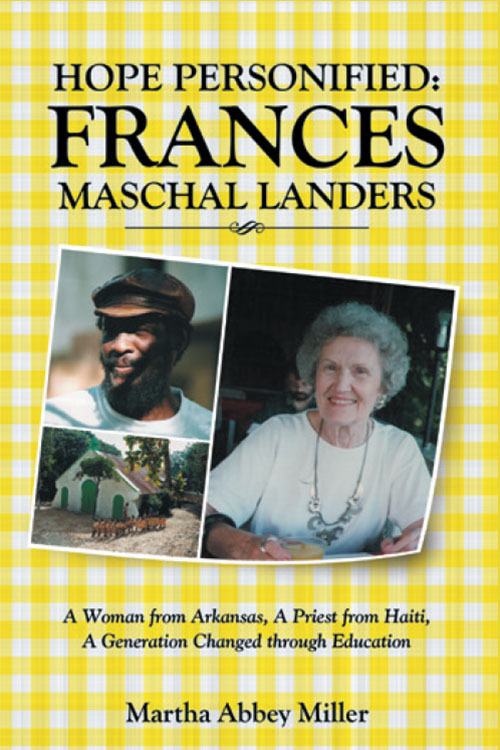 Read the story of Frances Landers and reflect that she made her first mission trip to Haiti at age sixty. Her forty-third trip at age ninety-one. We are never too old to make a difference in the lives of others. Martha Abbey Miller's first book, Hope Personified: Frances Maschal Landers, was published in August 2016 by WestBow Press. Enjoy the story of a woman from Arkansas, a priest from Haiti, and a generation changed through education. Hope Personified is available in hardbound, softbound, and ebook formats, through amazon.com, barnesandnoble.com, and westbowpress.com.